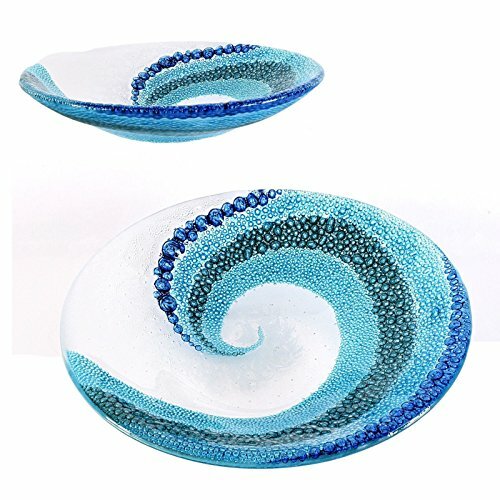 A smaller version of my Wave Bowl, this stunning, round, glass bowl, depicting crashing ocean waves, makes a beautiful and unique piece of table art. Display it on your coffee table or shelf. Add a stand for upright display which gives you added height. Perfect office or home decor with a beach or sea blue theme. Done in shades of blue green, including turquoise, aqua and sea green. It has 2 layers of clear glass that have been fully fused and annealed for maximum durability. The entire piece was hand painted with glass enamels and treated to force the bubble pattern. The texture and movement of the piece catches light while you catch your very own wave. Handcrafted in Cincinnati, Ohio. Note that the images with fruit are shown with 3 pieces for size comparison. Fruit pieces are average to large in size. Measures 8″ in diameter and is 2″ high. Done in sturdy 1/4 inch thick glass. All glass items are triple cushioned for guaranteed safe arrival. Ships via Priority Mail. Sending this item as a gift? Be sure to include a gift message with your order and I’ll include a beautiful note with your exact wording (see last image for sample note). Click on the “rainbow peacock” image, (to the right on a desktop or below on mobile), to see more of my glass creations and learn more about The Glass Rainbow studio. This entry was posted on August 25, 2018, in Uncategorized. Hand-made glass candle holder, cultural decorative collectibles for your house and office. There are 2 pcs in this options, each pattern have 1 pcs, size will be little smaller, diameter 3.2 inch(8.2 cm). European style pattern on the surface, the picture grain is inserted with thousands of small shiny bead, good texture feeling. Put a candle into the glass bowl, magic light decor for birthday, christmas, hallowmas and other party, best helper make a proposal and vow in darkness. Made by glass and colorful tiny bead, and bond with natural gypsum, healthy candle holder. Size(1 inch=2.54cm): diameter 8.2cm, pack of 2. Material: glass and handmade mosaic. Function: home office decor, car interior, candle holder, wedding decor, christmas decor etc. Packing: inner styrofoam and outer thick box. Function: decor for home festival, office, hotel, shopping mall and etc, make a proposal and vow. 1. Pls have a correct expectation for the size, as big as your palm 8.2cm(3.2 inch). 2. LED candle included instead of wax candle. 3. Pls allow little color difference because of camera and display screen. 4. Pls allow little colorful glass fragment fall down. >>2. European and America Fashion: Unique style design, sunflower, mosaic and other fashion pattern, all texture was handmade and let you feel high-grade, decorative bowl with magic light for home festival, office, hotel, shopping mall and etc. Safe 2-layer packing ensure it will not broke in shipping. >>3. 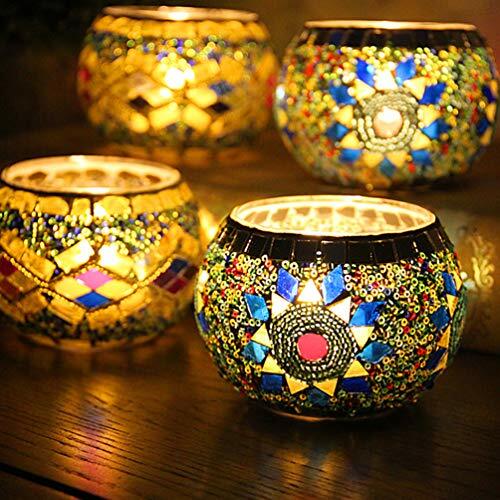 Magic LED Light Candle: We will present you a LED candle, put it into the shiny bowl, the LED light pass through glass bowl and colorful fragment, refract out magic yellow and various color light, best helper make a proposal and vow in darkness. >>4. Natural Healthy Material: All of the candle was made by natural material, glass, gypsum, lime and other healthy material, even place real paraffin candle in and it will be still safe, inner LED candle is low-power and low-heat, never worry about fire. >>5. Extreme Service Guarantee: USA registered trademark “YJY” for quality and service guarantee, unconditional full refund if you meet a broken item(just contact us), please notice only “YJY Home” is the owner of brand “YJY” and you could only enjoy the service from this store. Fast and reliable delivery, even if your order is non-prime and shipped from oversea warehouse by USPS, US buyer could also receive it in 8-14 days. This entry was posted on August 25, 2018, in Wood. 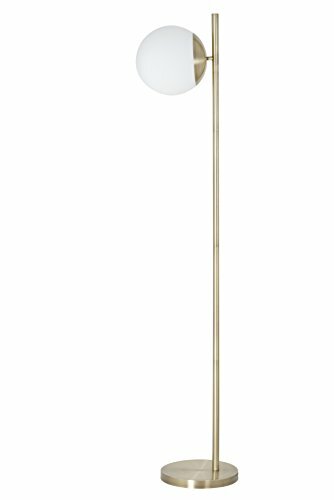 Bring a touch of modern elegance to your home with this 65” LED Carson Floor Lamp from Catalina Lighting. Featuring a brass metal arm attached to a frosted glass globe shade. The minimal design and simple shapes create an alluring balance of sophistication and charm for a living room, den or office. The 3-way touch works with an energy efficient integrated LED light and never has to be replaced. Updating the lighting in your home is the most effective way to accomplish a striking, yet simple, DIY remodel. This entry was posted on August 25, 2018, in Jewelry.